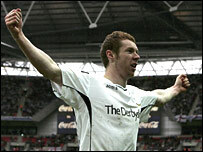 Stephen Pearson scored the only goal as Derby defeated West Brom to win the Championship play-off final and claim a place in next season's Premiership. 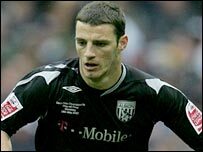 West Brom dominated large periods, with Stephen Bywater denying Diomansy Kamara, Jason Koumas and Paul Robinson, while Kevin Phillips hit the crossbar. Dean Kiely saved a Paul Peschisolido strike and a shot from Matt Oakley. But he could not stop Pearson converting Giles Barnes's low cross as Derby won a promotion worth £60m. The result is a triumph for Rams boss Billy Davies, who had failed in the previous two Championship play-off campaigns with former club Preston. But the Scot has ended his first season at Pride Park by guiding Derby back to the top flight for the first time since 2002. The Rams had finished the regular season eight points clear of West Brom - but Tony Mowbray's Baggies played the bulk of the football in the final and can consider themselves unfortunate to lose. The match had started at a cracking pace, with Derby struggling to contain West Brom's early surges. As early as the first minute Bywater was forced into a decent diving save to thwart Kamara. Derby's league campaign was built upon their determination, resilience and mean defence - and these qualities proved to be the foundation for their final victory. But an early sparkling run from Koumas threatened to unlock it completely and it took a brilliant last-ditch sliding tackle from Tyrone Mears to stop the Wales international. The Rams spent most of the opening period trying to force their way into the contest - but they did have one excellent chance after 10 minutes. Howard played Peschisolido into a huge gap in the centre of the West Brom back line but the 36-year-old, surprisingly recalled to the starting line-up, made a poor connection with his strike and Kiely saved easily. A jinking run from Craig Fagan saw the Birmingham-born forward cut in from the right touchline and shoot narrowly wide. But after an open end-to-end start to the final, both teams gradually cancelled each other out. Koumas looked the most likely to provide the missing inspiration and, after cutting inside with 40 minutes gone, drilled his strike narrowly over the crossbar. And Phillips ensured West Brom ended the half in the ascendancy with a crisp 20-yard strike that grazed the crossbar after a flowing move opened up the Rams defence. West Brom continued to create chances after the break - Bywater saving from Koumas and Kamara curling a free-kick over the bar. Derby, in contrast, struggled to impose themselves on the match and Davies introduced Barnes for Peschisolido after 59 minutes. And seconds later Derby almost scored when Oakley, who had pulled a shot wide earlier, made a brilliant contact with a Fagan cross only to be denied by Kiely's finger-tip save. But with 61 minutes gone Derby, somewhat against the run of play, did score. Howard played in Barnes to drill a low pass across the face of goal and Pearson got inside Paul McShane and slotted home his first goal for Derby to spark scenes of jubilation. Having made most of the running for most of the match, the Baggies continued to press, with Bywater requiring two attempts to claim a strike from Zoltan Gera. Bywater saved a Robinson header and most of the remainder of the game was played in the Derby half but West Brom could find no way to goal. Derby: Bywater, Mears, Leacock, Moore, McEveley, Fagan (Edworthy 83), Oakley, Seth Johnson (Jones 87), Pearson, Howard, Peschisolido (Barnes 58). Subs Not Used: Camp, Macken. Booked: Peschisolido, Mears, Bywater, Oakley, Jones. West Brom: Kiely, McShane (Ellington 71), Perry, Sodje (Clement 81), Robinson, Koumas, Greening, Gera (Carter 71), Koren, Kamara, Phillips. Subs Not Used: Daniels, Chaplow. Can Derby stay in the Premiership?